"I was very scared to hear that I had cancer." Just days before his 10th birthday, Travis Selinka began to feel dizzy. The dizziness was later accompanied by a headache and nausea that, within three months, became an everyday occurrence. The condition was causing Travis to lose weight and making it nearly impossible to finish the school day. After several months of various testing with no improvement, Travis’ parents’ concern grew to alarm. Lynne and Tony brought their son to Rady Children’s for further evaluation. Travis was diagnosed with Medulloblastoma, a malignant brain tumor, and he needed immediate neurosurgery, followed by cancer treatment involving radiation and chemotherapy over the rest of the year. For Travis, John Crawford, MD, MS, director of Neuro-Oncology at Rady Children’s recommended proton beam therapy as the best course of radiation treatment for Travis in his fight against cancer. Considered the ideal form of radiation for pediatric patients, it provides a more precise approach to destroying certain tumors and cancers compared to conventional X-ray radiation. The treatment is also less invasive—and especially critical for children, proton therapy minimizes damage to healthy tissues and helps curtail long-term complications. For seven weeks, Travis received proton therapy. Travis was given one month off after proton therapy before he started six more rounds of chemotherapy over the course of multiple hospital stays. Travis asked Santa, “Can I please be done with chemo before Christmas?” His last round of chemo was on December 17, 2013, just like he wished. Travis’ positive attitude and tough battle against cancer earned him the nickname Travis the Warrior, a nickname that remains. 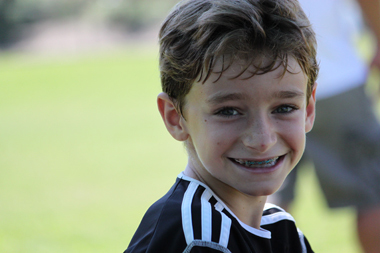 Today, 13-year-old Travis is looking forward to returning to soccer, a game he loves, and enjoys going to school with his friends. Donate now and help kids like Travis.